Docking Station Road postmill was built with common sails and at least one pair were removed and offered for sale in 1829. As the oak windshaft was also offered for sale it is likely the mill had been fitted with one, possibly two pairs of patent sails to drive 2 pairs of stones. The Co-Partnership between Messrs. Frost & Sturley of Docking in the county of Norfolk, Millers, being by mutual consent dissolved, all such persons as now stand indebted to them are requested immediately to pay the amount of their respective debts to Mr. Frost or Mr. Sturley. A single man that perfectly understands his business. Apply personally to Mr. William Sturley, Docking, Norfolk. A Capital POST WINDMILL in substantial repair with all going gears complete, together with a neat dwelling house, yard, gardens, homestall, barn, stables, piggeries, granaries & other outbuildings necessary for carrying on the trade of a Miller; pleasantly situated in the parish of Docking in the county of Norfolk, now in the occupation of Mr. William Sturley, the proprietor, who is retiring from business. A considerable part of the purchase money may remain secured on the premises & possession may be had at Michaelmas next. The whole estate is freehold. Enquire at the office of Messrs. Goodwin & Son, Lynn or to Mr. Wm. Sturley on the premises. A SINGLE MAN who well understands the Business of MILLING & BAKING may have constant employment by applying personally or by letter post paid to Mr. Joseph Curl, Docking. A character will be required. A Respectable YOUTH or APPRENTICE to the above Business. Applyn to Mr. Jos. Curl, Miller, Docking. A pair of Capital Common SAILS & OAK shaft. Apply to Mr. Kerrison, Millwright, Snoring or Mr. Jas. Curl, Docking Mill. A Respectable Situation for a Youth 16 years of age as an APPRENTICE to a MILLER, where he will be treated as one of the family. A liberal premium will be given. Apply by letter (post paid) to A. B., Post Office, Docking. By a YOUNG MAN A situation as JOURNEYMAN who has served his Apprenticeship. Wages not so much an object as a comfortable situation. Apply to T. Sturley, Docking. If by letter, post paid. White's of 1854 lists both William Wagg and Olivia Wagg as bakers and Olivia as a farmer. Neither are listed as miller although Thomas James Ayre of Castle_Rising_postmill is listed as a miller. It is probable that he was the owner of a mill, although it is unclear as to which one. Harry Apling mentions that a Henry Hillen was a foreman miller. WANTED, a MILLER who thoroughly understands his business, with good reference from last employer. Apply to James Lack, Farmer & Miller, Docking, Lynn, Norfolk. All that substantially built CORN WIND MILL driving two pairs of Stones, with the MESSUAGE or TENEMENT, Barn, Stable, Garden & LAND thereto belonging, now in the occupation of Mr. James Lack. The above are situate in Docking & contain (with the site of the buildings) 1a. 2r. 22p. or thereabouts, at a short distance from the Railway Station there & in a district where a large business may be carried on. Possession of the Mill & Premises in the occupation of Mr. Lack may be had at Michaelmas next. Apply to Mr. Thos. Curl, Sedgeford, the Auctioneer, Oxwick or at my office. WANTED, a thoroughly competent MAN with a good character & to make himself generally useful. Apply to James Lack, Miller etc., Docking. WANTED immediately, a thoroughly respectable Man as MILLER & BAKER. One who understands the Milling in all its branches. None need apply who canot be well recommended. Address F. Lark, Miller, Docking. Mr. James Lack, miller & baker, Docking, having retired from business in favor of Mr. I. Wagg, requests that all debts due to him may be paid to Mr. Wagg & all persons to whom he is indebted will please forward their accounts. WANTED, a Single Man as MILLER & BAKER. WANTED, a thoroughly Competent Man as first hand. Good wages. Wanted, a thoroughly competent man. Apply to Joseph Wagg, Miller & Baker, Docking, Kings Lynn. On 30th March 1971, Miss Daphne M. Smith of 2 Mill Yard, Station Road, Docking, wrote to Harry Apling to say the mill was on her property and not that of the nearby Mill House. The deeds recorded that the mill, formerly in the possession of William Sturley, was conveyed to Joseph Curl on 17-18th May 1830. On 14th Ferbruary 1870 ? Sutherland sold the property to Robert Chambers for £1350. T. R. Wagg (The Baker) Ltd. 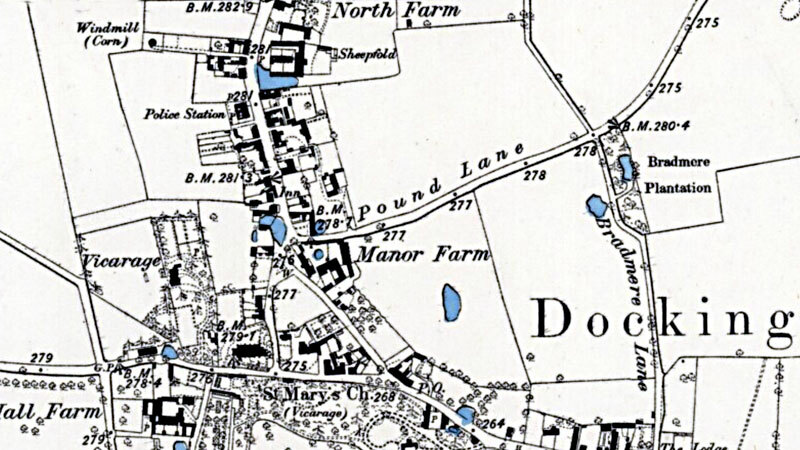 He was born 1801 & in 1839 (Pigot’s) is mentioned as miller owning a mill which stood at the end of Mill lane in Station road opposite North Farm. Adjacent field still Mill Pasture & is marked (E) on the large map. Also shown as baker. Rowland Wagg married Florence Annie ? Whilst staying at the Mill House in early October, I had a weird experience,I hasten to add this was not a frightening experience. I had fallen asleep in the sitting room after turning off the TV leaving only the light turned down low in the kitchen I do not know what the time was but I awoke to find an image of a young man leaning over the coffee table (no I had not been drinking either). He appeared to be in dark colours possibly overalls or an old type jacket with small collar and buttons. At first I thought it was my own son who is disabled and at the time was sleeping at the other end of the house my husband was with him but realised he was not dressed as this young man was. I then thought I must have been dreaming and closed my eyes again only to be woken by the sound of the small radio which my son has. It plays nursery rhymes. In order to make it play you have to press a large button. It was then I realised that the radio was on the table where I had seen this young man leaning over. I jumped up mainly to turn the radio off in case it disturbed my son and husband and went to check that they were in bed which they were. I would be grateful for any information maybe someone knows if there have been other sightings. I see from the website that there was a young man called William Wagg junior born 1836 and died 1856 who was the miller. Both boys were indeed master Bakers at Docking.